You thought that my Blue Period was gonna be a one-off sort of thing, didn't you. Ha. I'll show you. I'll show all of you that I'm not the sort to back down to a lack of pressure! I'll be straight with you this one is very cheaply made. Don't expect this sort of low quality in the rest of the series. 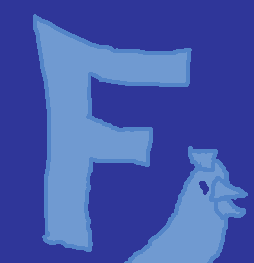 Anyways this is F. Obviously it is the next piece in my alphabet series. For some reason I just felt like I should get D., E. and F. done around the same time. I mean taking a break after F is perfectly reasonable but between E and F would have simply been unacceptable. You've got to commit to your blue period. Good man.